The main view is called the Electronic Planning Board (EPB) or the Board, and is the heart of Prestige Scheduler. Its a snap to see the step by step workflow and dependencies for all your scheduled jobs. Zoom in or out to show from 10 hours to about 10 weeks at a time. Scheduler works around three central screens. The main view is called the Electronic Planning Board (EPB) or the Board, and is the heart of Prestige Scheduler. Here you can see the big picture while noticing a great amount of detail as well. 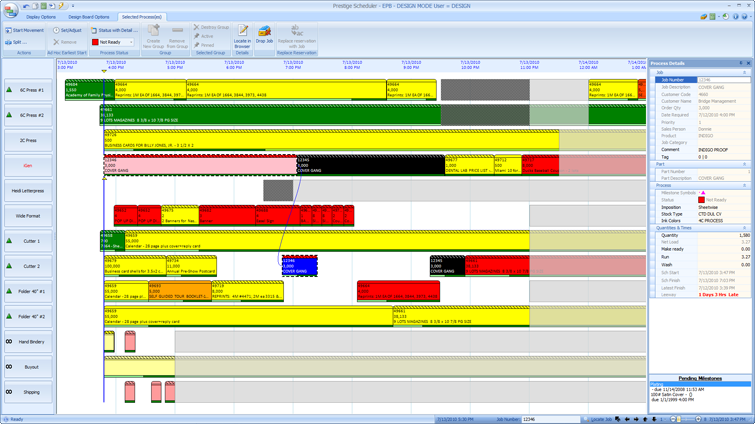 Resources run down the left side and the colored bars represent various activities along the timeline. It’s easy to see jobs in danger of not starting on time (red bars nearing the now line), as well as those already late (hatch pattern in status strip). Select any bar and Scheduler highlights and connects the whole job. As seen below, each bar contains a wealth of information at a glance, and may be configured to show just what you need.The Electronic Planning Board is fully interactive. You can select one or more bars and click to move them left or right along the timeline, and to other machines (in the same group.) As you make changes Prestige is recalculating and reflowing the work to enforce the job constraints and minimize the gaps between jobs. The next screen can actually be many screens. It is the list view of work for any given resource. You can open this screen any time and display a different resource in each, or easily switch from resource to resource within a single screen. This work list is a configurable grid showing everything you need to organize your work intelligently and quickly. Sort by any column to locate similar work and group jobs that should run together. From the EPB and work lists, a keystroke or mouse click opens the Job Browser. If the Board is the heart of Prestige, then the Job Browser is its brain. A configurable smart grid shows all scheduled and unscheduled jobs. Click the plus to expand any job and see all its details. Edit any specs as you go and add or remove items just as easily. For even more detail at any given level, just expand the panel at the right. Use your existing estimating/production order system to provide job details to Scheduler without re-entering data. You can easily modify the job as needed before or anytime after the job is scheduled. Changes in your system can automatically or interactively update the job in Scheduler. Prestige works well to extend MRP systems, providing the day-to-day scheduling detail that monthly MRP systems lack. Track anticipated inventory consumption for just-in-time stock deliveries. Stock requirements and status can be viewed at the process, part, or job level. Connect to your raw-material inventory to allocate on-hand stock against scheduled jobs, and track outstanding POs and receipts for better visibility. Utilize Prestige Scheduler for shop floor data collection or keep scheduler up to date with the shop floor by connecting it with your data collection system. Take advantage of direct machine interfaces to update and display minute by minute quantity updates on the active board. All three screens are perfectly synchronized. If you have two or more monitors and can view these screens simultaneously, you will see the same process in the job browser that you click on in the EPB or list and vice versa. You must define a job’s production plan before you can place the job on the board. The production plan specifies the Processes used to manufacture the job. You can create a job and its production plan entirely within Prestige Scheduler; or you can import the job and plan from an external MIS system. Jobs when initially created or imported get placed in Scheduler’s in box. You can place the job onto the board either from the Job Browser or from a resource’s Work List. A job in Prestige Scheduler is composed of parts, and parts contain processes. A process is equivalent to a bar on the board and is composed of undone make ready, run, and wash up time. Processes on one part are ordered by routing number and are considered dependent. Different parts are routed in parallel and constraints are used to connect them together. Material and milestone constraints may be attached to any process. This combination lets us model virtually any workflow and can usually match your MIS in job structure. Scheduler can be set up globally to backward schedule (just in time scheduling) or can be set up to forward schedule but individual jobs in this case can still be flagged to be backward scheduled. In the latter case, backward scheduled jobs take precedence over forward scheduled jobs and are said to be “locked at latest finish.” Jobs already on the board can be swapped between backward and forward scheduled at will. For Forward-Scheduled jobs, Bars are placed on the board in order of each job’s relative priority. No notice is taken of the Job’s promised by date. Backward scheduling forces Scheduler to place each job so that it will finish just in time. The priority of each job is still significant where there is contention for space on the Board. Higher priority jobs will get first chance. 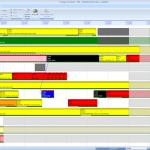 Scheduler graphically tracks each job through to its completion. Once completed, a job is not visible in Scheduler’s Job Browser; however all the job’s details are still in the database for statistical reporting purposes. What-If simulation mode for editing and planning, restricted to single user per board (at a time) Live, real-time view of plan, viewable by everyone from the shop floor to the front office and online. Updated by shop floor status changes. Work with an offline, static snapshot of the live schedule. Experiment without affecting the live schedule until you publish. Continuously updated to reflect current shop floor status. Manipulate the schedule: place jobs on the board, re-sequence and reassign work, manipulate job specs, control machine hours (capacity) View or update job status (data collection functions.) Can’t edit jobs or change schedule. Contact us at +1 425 481 9345 to set up your 60-day trial period of Prestige Scheduler. Once you try it, you’ll wonder how you got along without it. The PSI, ePACE, Hagen OA, Logic, Avanti, Printers Software, GreatPlains, JD Edwards, and BPCS brand names are all registered trademarks of their respective owners. Pivotal Z claims no endorsement by these brand owners unless specifically stated.